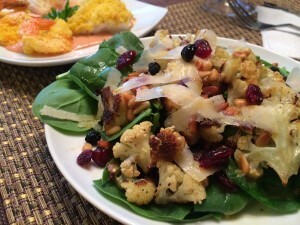 My friend Eileen knows that I really love Cauliflower and this recipe was based off of a link she sent me with a variety of ways to use this healthy and delicious vegetable! I love it raw or cooked; in salads or with a dunk in simple dip; I love it in soup and roasted… well, really just about any way you can think of! The cauliflower head holds numerous health benefiting nutrients such as vitamins, indole-3-carbinol, sulforaphane etc., that help prevent people from becoming overweight; it helps prevent diabetes and offers protection from prostate, ovarian, and cervical cancers. This is a simple salad loaded with flavor and I almost always have all of the ingredients on hand! Preheat your oven to 400 degrees and spread the chopped cauliflower florets onto a baking sheet and drizzle with olive oil before tossing with salt and pepper. Roast in the oven for about 30 minutes, turning from time to time until it is browned to your liking and cooked through. Remove from the oven and allow to cool a bit. Meanwhile, whisk together lemon juice and zest, mustard, olive oil and salt and pepper to taste in a small bowl. Top the spinach with roasted cauliflower, berries, toasted pine nuts and parmesan shavings and drizzle the dressing over the top.